The Welsh Centre for Printing and Coating (WCPC) and Swansea Univeristy’s College of Engineering has partnered with NovaCentrix to install a specialist system to cure printed electronic inks. The Welsh Centre for Printing and Coating (WCPC) and Swansea Univeristy’s College of Engineering has partnered with NovaCentrix to install a specialist system to cure printed electronic inks. 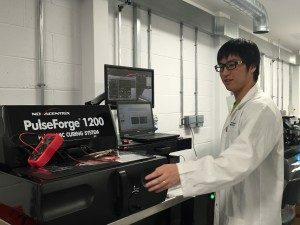 The NovaCentrix PulseForge 1200, designed for the high speed photonic cure, is available in the open access WCPC laboratories. The equipment has already been put to work on projects for printed Radio Frequency Identification (RFID) and Near Field Communication (NFC) antennas for smart packaging and assisted living applications. Photonic curing is a high-intensity pulsed light technology enabling conductive inks to be sintered or annealed in a matter of milliseconds. The sintering of the ink occurs with minimal or no damage to inexpensive and flexible substrates such as plastic, paper or cardboard. Scale up for production of items such as wearable electronics and medical sensors can immediately be applied to volume production using the PulseForge platforms already available and in use for manufacturing of products sold world-wide.